Carbon Foils accurately characterized, in any thickness you need. For more than 47 years (since 1970), ACF-Metals, The Arizona Carbon Foil Co., Inc. has been dedicated to providing accurately characterized ultra-thin foils and coatings of carbon in thicknesses less than one micron and up to a few microns thick. 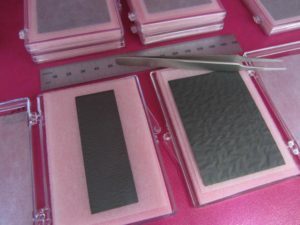 Carbon foils made by ACF-Metals are used in nuclear, space, physics, time of flight studies, optical, chemical, medical and microscopy research. 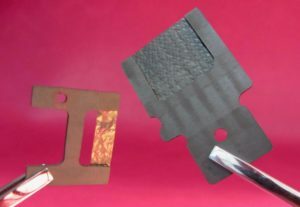 These are the most common stripper/extractor foils ( charge-changing foils) and target supporting foils involved in manufacturing and research using particle accelerators. Amorphous carbon foils of highest purity, uniformity, and stability. Natural isotopic composition: carbon-12 with 1.1% carbon-13. 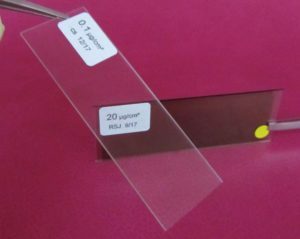 0.1 µg/sq.com up to 2000 µg/sq.com always in stock with ACF Co. Inc. Custom shape, size and areal density specifications. On glass substrates, freestanding or mounted. Polycrystalline Graphite (PCG) foils are as efficient as amorphous carbon foils and have in-beam lifetimes competitive with arc-evaporated foils. Mounted stripper/extractor for extended lifetimes. Arc evaporated foils and PCG foils. Fork material, Al or Graphite. Guaranteed delivery to Australia or New Zealand without damage. For additional information and prices for any product described in the Technical Information brochure, please complete the request form below and we will provide our quotation as soon as possible.